Over the years, I've heard dozens of young people -- especially women -- apologizing profusely in the workplace, even when they've done nothing wrong. This tendency to apologize is dangerous; it affects the way young professionals feel about themselves, and it can even set them back in their career. If you're starting out in the workplace, you need to believe in your actions so deeply that you stand behind them, or else rethink them all together. 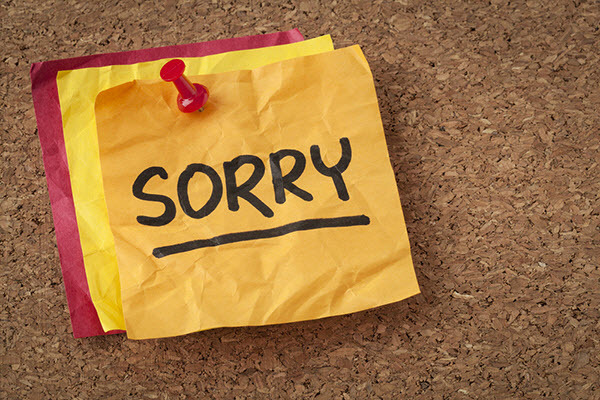 Unnecessary or avoidable apologizing can hurt your professional self. Why? Because apologizing when you've done nothing wrong isn't fair to yourself, and apologizing too often can lessen the power of the words when you've actually made a mistake. If you apologize too much, your audience will no longer accept it as legitimate. The apologies become irrelevant and exhausted. As professional women's coach and TEDX speaker Melody Wildling notes on her blog, apologies that come across as insincere break professional trust and set women back in achieving their goals. Most people can admit that they've used the phrase "I'm sorry" as an easy way out. Sometimes rushing to admit fault makes it easier to ignore mistakes, because you feel like you've made amends by quickly acknowledging you were wrong. Some people saying "I'm sorry" -- whether they mean it or not -- wash their hands of the issue, and move on. Ever done this? Everyone has. But, apologizing does not course correct, or offer a solution. Many times, we'd be better served by removing the "I'm sorry" and replacing it with something more valuable. The potential downsides of "sorry" raise a lot of questions. What happens when you do make a mistake? How does an apology then affect our professional lives? How can we avoid an apology while still acknowledging change is necessary? And when do apologies really have a place? To figure these out for yourself, follow these three steps. If you took a misguided approach to a task, rather than making a conscious bad decision, you can offer a solution to your mistake instead. For example, if you sent an email to an important client, but there is information missing and you need to send an additional email. Skip the "I'm sorry, forgot one thing!" or "My apologies, here is the missing information," and move right to the "In my last email I did not include X. Below are the additional details." You have not admitted fault, you have simply corrected a mistake. You can take it further as well. Maybe it's your boss who noticed the mistake, and now you have to fix it. Instead of "I'm so sorry I forgot that information," try "You are correct, I did not include that information, I will send it now." Working like this makes you look polished, professional and confident and shows that you're willing to do what's needed to keep things moving. The more you can proactively address your mistakes, the better your professional performance will be. A 2010 study by Humbolt State University professor Gregg J. Gold found that the most important factor of a successful apology is that the person who made the mistake can demonstrate empathy, which usually requires time. People who say sorry too quickly give the impression that they haven't really thought through all the repercussions of their actions. Prove that you don't see your apology as a get-out-of-jail-free card by talking through why mistake is important and really trying to fix it. Let's say you're late to a meeting. Your instinct might be to say, "So sorry, I'm late!" Instead try "Thank you for your patience." I have personally used this technique and have found that expressing gratitude instead of remorse or regret completely changes the tone you set when walking into a room or starting a conversation. You are acknowledging the issue in addition, yet setting up a positive environment for what's to come. Saying thank you shows that you are respectful of your colleagues' time, but keeps you from looking critical of yourself. "Sorry" can make you look -- and feel -- inferior to the people you're working with. It may affect the way they look at you, or worse -- the way you feel about yourself. An Ohio State University study validates something you might already know: Poor self-confidence seriously hurts young people with professional goals. If you believe you are bad at your job, you won't aim as high as you otherwise might. Mentally categorizing missteps as "offenses" is a dangerous practice, and it disproportionately affects young women. According to the Association of Psychological Science, women report not only apologizing more often than men, but also doing more things "wrong." It's not that women just apologize more -- it's that they perceive more mistakes in themselves. That isn't accurate, and it isn't healthy. Sometimes, the situation still calls for a downright apology. Such is life! To understand if the situation truly warrants words of atonement, ask yourself honestly whether you've made your most conscious decision, explore other unapologetic avenues, and see if you still believe an apology is necessary. This is the only good recipe for a genuine apology. This authenticity is necessary for an apology, and without it, the apology is useless. This thoughtfulness in deciding to use an apology, after exploring other tactics for problem solving, will help you make conscious decisions about apologizing rather than using apologies senselessly. When you say sorry, your coworkers will know that you mean it. As Megan Orcholski, a teacher of communication at Concordia College, says in her TEDx talk, "If you are conscious in your choices and have strong, thoughtful reasoning for your choices, you should not have to apologize." In other words, you are who you are, and if you are living authentically and consciously, there is no apology needed. If you do make an error and truly find that it's time to apologize, then the "sorry" you give will really count.